Shares of HollyFrontier, PBF Energy, Delek US Holdings, and Alon USA Energy were up by double digits last month. 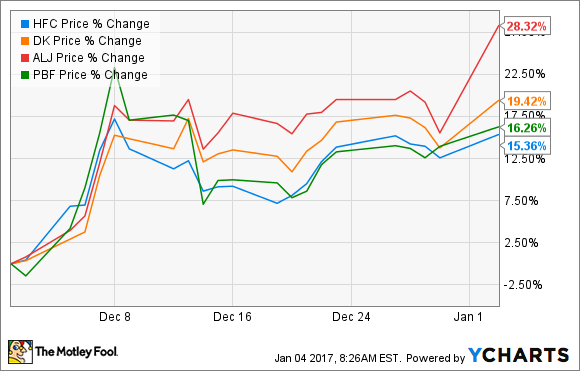 December was a great month to be a refiner, although not for the reasons one might normally think. Smaller independent refiners PBF Energy (NYSE:PBF), HollyFrontier (NYSE:HFC), Delek US Holdings (NYSE:DK), and Alon USA Energy (NYSE:ALJ) all posted double-digit gains. Based on the changes in oil prices last month, the knee-jerk reaction of most investors would be to sell refiners. OPEC's announcement that it would cut production helped bump the price of crude oil to its highest levels in over a year. For refiners, this isn't a great position to be in because rising crude oil prices means a smaller price difference between crude and the refined products they produce. There are two major reasons why this wasn't the case with these smaller refiners in December. One is that the energy industry in general received a significant boost in investor confidence following the OPEC announcement. This broad buying of the industry seemed to have carried these companies with it. The other is a little more nuanced, and it has to do with the incoming administration. Donald Trump has nominated Carl Icahn to a special advisory position on regulatory reform. Icahn, a majority shareholder in independent refiner CVR Refining -- has stated very publicly his disapproval of the U.S. Environmental Protection Agency's regulations on ethanol and the renewable fuel standards. These regulations do hit independent refiners harder than companies with retail, wholesale distribution, or ethanol manufacturing capability, as they are able to recover blending costs. Nearly every independent refiner has said during conference calls this year that compliance costs for these alternative fuel standards have run into the hundreds of millions of dollars, and that the opacity of the market has made it rife for speculation and corruption. If these rules were to go away -- and it appears that the market is thinking it's a possibility -- then it wouldn't be surprising to see profits for these companies rise considerably. One thing that should also be noted is that this past month, on December 13, PBF Energy did a public offering for Class A common stock worth about $277 million it intends to use to pay down some debt and for what it said were general corporate purposes. The market wasn't a big fan of the move initially, but PBF's debt load was a bit higher than most of its peers. So using this higher stock price to shore up the balance sheet isn't the worst idea. On January 3, Delek US Holdings announced that it would acquire all remaining shares outstanding in Alon USA Energy -- it owned 47% of shares already. This makes for another major acquisition in the refining industry as companies look to consolidate to compete. There were rumors for a while that Delek was in talks with CVR Refining's parent for a potential acquisition, but little has been discussed on that front in some time. It's also worth noting that HollyFrontier made its own acquisition a couple of months ago when it purchased Suncor Energy's lubricant manufacturing facility. So, compared to last year, the refining landscape looks a whole lot different. As far as what the future holds for these companies, it's hard to say. If refined product prices rise at the same pace or faster than crude oil, then we could see some big gains, but there is no guarantee that will happen. With Alon and Delek set to merge and HollyFrontier adding a lubricants business, investors will certainly want to watch the coming quarters to see how these moves impact the bottom line.